Woven mohair, horsehair and yarn rug, with rectangular Union Flag design in white and grey. Reversible flat weave in Union Jack design. 2-ply carpet wool, brushed mohair and horsehair. Woven in shaft-switching technique on a specially adapted loom. 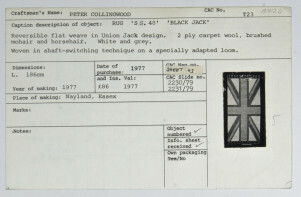 Black Jack, Peter Collingwood, 1977, Crafts Council Collection: T23. Photo: Heini Schneebeli.